Elderly people are more vulnerable to illnesses in the winter, sadly over the winter of 2016-17 there were 31,800 excess winter deaths among the over 65s from cold-related illness such as heart attacks and strokes*, one of the reasons being is that cold weather suppresses the immune system. Therefore, its really important that anybody caring for the elderly during the winter months is fully prepared for the challenges that the weather can bring and be able to offer advice and help that is both practical and helps prevent illnesses. Over 65s qualify for a free flu jab under the NHS each year. Flu can increase your risk of more serious illnesses such as pneumonia. People can get the jab easily; at their doctors or at participating pharmacists. Persons over 65 years old are also eligible for a free Pneumo Jab; this is a vaccine that helps protect against Pneumococcal infections that can lead to pneumonia, septicemia and meningitis. For people over 65 years old, it’s only given only once as it offers lifelong protection. If you care for an older person it’s important to be aware of the first signs of illness so that people can get to their doctors as soon as possible in order to get necessary treatment quickly. Ensure that when visiting older people they do not seem drowsy, unaware, or have a cough or cold that has not been treated. It’s also a good idea for the elderly to have basic medication in their medicine cabinet for any ailments that can dealt with at home, for example: cough mixture, cough sweets, flu tablets, pain relief: paracetamol and ibuprofen. Older people are more prone to the cold – they take longer to get warm, lose heat more quickly, and are usually less active so it’s easier for them to get cold. Their homes should be warm, at least 18 degrees Celsius, and they should wear enough layers to feel warm and comfortable. Draft excluders and lined/insulated curtains are also a good way of keeping in the heat, and hot water bottles in bed, or when a person is sitting for a long period of time also provide extra comfort. If someone is cold, it’s important to get them in warm clothes, wrap them in a blanket and also put a hat on, if necessary, to bring their body temperature up. Clearly, it’s better for older people to avoid going out in icy weather when they are more at risk from slipping and falling. However if journeys are essential, people should wrap up warm and wear shoes with good grips, salt can also be used on pathways to aid walking and grip. During winter months, when sunshine is sometimes scarce, eating and drinking the right foods and liquids can help the elderly stay healthy. Drinking more milk and eating more dairy can help build immunity in the winter as it contain proteins, Vitamin A, Vitamin B12, and calcium for strong bones. Including oily fish (for example salmon, mackerel and sardines), eggs, red meat, margarine, some cereals and dairy products can also provide Vitamin D, a vitamin that is normally produced by your body when it’s exposed to the sun. Vitamin D is essential for calcium absorption and bone growth/health. Keeping a food cupboard well stocked in case of bad weather with all the essentials (pulses, pasta, and tinned food), frozen meals and long-life milk is also a good idea and can help prevent unnecessary trips in the icy weather. Drinking warm drinks can also help older people keep warm and toasty! The winter months can sometimes feel long and lonely; Age UK revealed that every month more than one million elderly people don’t get to speak to family, a friend or a neighbour. 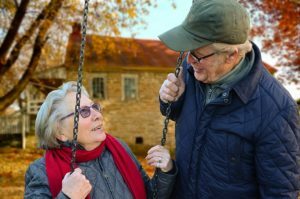 Just being able to visit and care for an older person on a regular basis can bring immeasurable benefits to a person’s mental health and well-being. Being aware of your elderly relative’s comfort and welfare is essential, especially when they are being looked after by carers. 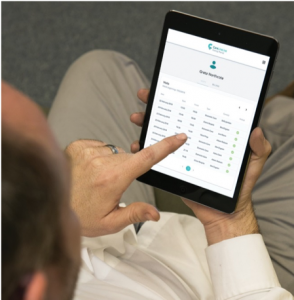 CareLineLive’s Mobile App used by Carers enables Home Care agency’s to keep the relatives of their clients up to date with their client’s well-being and any issues. 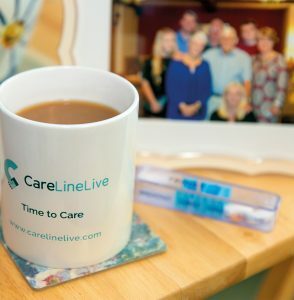 Relatives have access to the CareLineLive Family and Friends website that provides that latest information on their loved one’s care including visit confirmations and any updates. Ensuring our older population are looked after and protected against the elements that the winter months can bring is critical for anybody who is involved in the care of the elderly.